SINGAPORE (SHAPE SINGAPORE) - Upgrade your juice with these nutritionist-certified combinations. 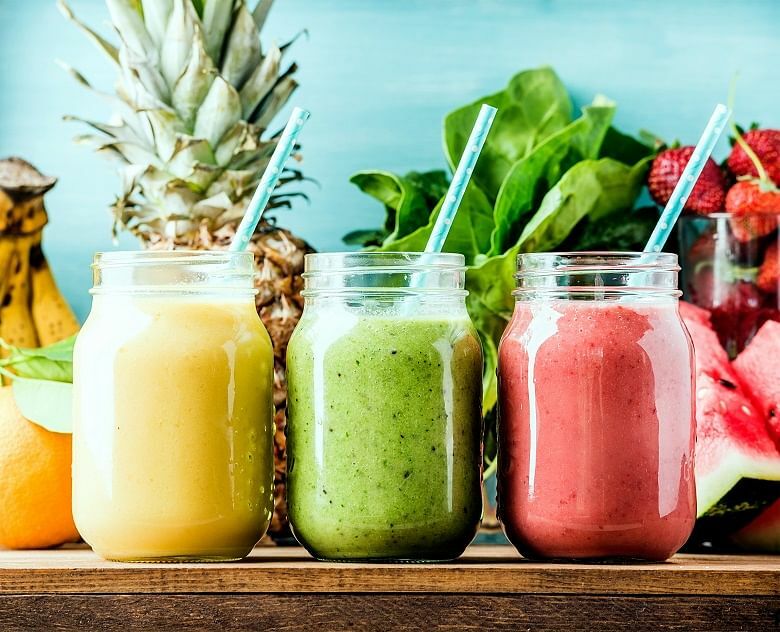 Juices and smoothies are a great way to finish off your lunch — sweet and tasty but without the guilt of a sugary dessert. Everyone loves this post-meal ritual which gives a nice nutritional boost to overall health. Here’s a nutritionist-approved list of mixed juices and smoothies you might not immediately think of. These unusual formulas satisfy and boost your vitamin and mineral intake. So go ahead, mix it up and enjoy! Starfruit is a top performer in the nutrition arena, but is low on the list as a choice for juices because of its sour taste. Still, the citrusy fruit has a low calorie count (some of the lowest calories per portion in the fruit world), and is packed with half your daily vitamin C intake per 100ml. It contains B-complex vitamins, huge amounts of minerals like potassium, which negates the effects of high sodium intake. Pair it with sweet strawberries, which help to offset starfruit’s tartness. Strawberries add antioxidant and polyphenolic compounds to this pink punch, helping to boost your immune system. Sweet papaya replaces gula melaka in this twist to the popular avocado food stall drink. As a superfood, avocado gives you a wide array of vitamins, including vitamins K, C, B5, B6 and E, and also rich amounts of potassium and oleic acid which lowers blood pressure and helps with cardiac stress. Eating avocados can help lower bad cholesterol and triglycerides, while papaya injects a good dose of the powerful antioxidant, lycopene. The carotenoids found in papaya help fight free radicals, and so improves the complexion, heart health and even prevents cancer. You’ve heard that whatever tastes bitter must be good for you. Pairing bittergourd with sweet apples and tart lemons helps improve the flavour of bittergourd, which and turns this combo into a natural weight-loss drink. Ms Josephine Ng, a nutritional therapist at The Nutrition Mentor says that this drink stimulates the liver to produce bile for fat digestion. “An insulin-like compound called Polypeptide-p also helps to regulate blood sugar and thus helps to control diabetes,” she says. The apple contains soluble fibre pectin, which helps to bind and remove toxic waste from the intestines for a good, detoxing clear-out. Pear doesn’t feature highly in juicing but this refreshing combination should have you ordering it next time you visit a juice stall. Its high levels of pectin fibre means it lowers cholesterol and increases digestive health. The massive fibre boost also means you stay fuller, for a longer time. Add nutrient-dense kale, which contains all the essential vitamins and several cancer-fighting compounds like sulforaphane and indole-3-carbinol, and you have yourself a miracle drink. Cool cucumber rounds out this power mix. It contains silica, which helps repair connective tissues and brighten skin. Pair avocado with celery and cucumber, which helps add lightness to the dense superfood. “Vegetables with high water content blend well with creamy avocado,” says Josephine. “The celery and cucumber suit Singapore’s hot, humid climate as they have cooling properties.” Celery’s role here is to reduce blood pressure while supplying water and electrolytes to replenish nutrients lost through sweat. The cucumber does the same and adds vitamin A, B, and C to boost immunity. Lemon slows down oxidation and tops up on vitamin C. Hydrating and refreshing, this is the perfect drink after a good workout! This lip-smacking recipe features sweet mango, cherries, and slushy dragonfruit. The rainbow of vitamins and minerals that mangoes have make it a great aid to eye health, thanks to its high dose of vitamin A and beta-carotene. It’s also great after a meal of grilled meats because a spectrum of compounds unique to the fruit, like polyphenols and mangiferin, make it a perfect anti-carcinogen and antioxidant. The tart cherries help activate PPAR (peroxisome proliferator activating receptors) in your tissues, promote heart health and reduce stroke risk. Dragonfruit seals the deal for your immune system, with its antibacterial and antifungal properties. The natural sugars of the sugarcane make it better than any artificial energy drink, hands down. Drink it to prevent a post-meal slump! With its high concentration of magnesium, potassium, calcium and iron, it creates an alkaline environment that helps to prevent cancer. Carrots add an earthiness to the mix and gets plenty of fibre and vitamin A into you, to help keep you bright-eyed through the work day. These tropical fruits are big digestion aids. “Both papaya and pineapple are full of proteolytic enzymes,” says Ms Ng. “This combination is perfect after a meat-heavy meal as it helps you to digest proteins.” The papaya also relieves constipation too if you’re feeling a little clogged up. Choosing this trio means your system gets a huge dose of beta carotene, vitamin C and bioflavonoids, which are the cornerstones of healthy body functionality. Strong teeth and bones — that’s what you’ll get by consuming this refreshingly creamy concoction, thanks to the honeydew and milk. Melon also contains a high level of calcium and potassium, which relieves hypertension. Green apples have more fibre than their red cousins, and also impart a pleasant tartness to this juice mix. Fibre aids in digestive maintenance, reduces colon cancer risk, and lowers cholesterol. At Haig Road Food Centre’s stall 01-32, the buah long long (or golden apple) is the star that dominates the menu. A cup of this citrusy juice helps with anaemia, thanks to its high doses of iron and vitamin B1, which boost red blood cell count and help improve oxygen flow in the system. The grassy flavour is delicious, and you’ll sometimes find this juice mixed with sour plum, which adds more vitamins for an overall immunity boost. This mouthwatering blend of soursop and coconut milk helps to clears out the digestive system. Soursop contains plenty of fibre to help with this task, as well as acetogenins which have anti-cancer properties. Coconut milk contains lauric acid, which is easily absorbed by the body to use as energy. It also enhances physical performance, brain function and aids in weight loss. Tasty and transformative… We’re sold! You are a sprinkle away from good heart health. These crunchy seeds contain a high level of fibre, plus they’re good for your digestive tract and come with anti-inflammatory benefits. It may be pungent but a small teaspoon of the bioactive root in its ground form is enough to keep chronic inflammation at bay. It’s perfect for that after-lunch treat because it helps with digestion, and has significant brain-boosting benefits. This gives a spicy kick to your drink, and is a natural digestive aid. And guess what — it’s the perfect buddy to go along with turmeric, as it aids absorption of the curcumin in turmeric by 2,000 per cent.